The whole scenery is fascinating, with the waters running from the springs, the cool under the plane - trees and the little creeks brim over near the sea. The beach consists of little white pebbles and crystal - clear blue waters. 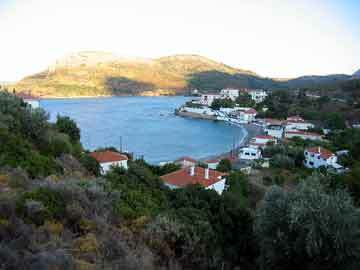 It is one of the most amazing coasts in the island. The small chapel that is built to the top of the hill, up from the beach, gives an exceptional beauty to the landscape. Moreover, there are many restaurants and taverns in the area, offering the visitor fresh fishes and delicious Greek cuisine dishes.